We’ve had an incredible few weeks, with many of our favorite Outlander characters appearing in casting news for the upcoming Starz television series. But the most anticipated by far is the role of Claire. And now that the role has been fulfilled (by Caitriona Balfe), what better way to celebrate than with a giveaway?! Let’s call it a Claire-ebration! 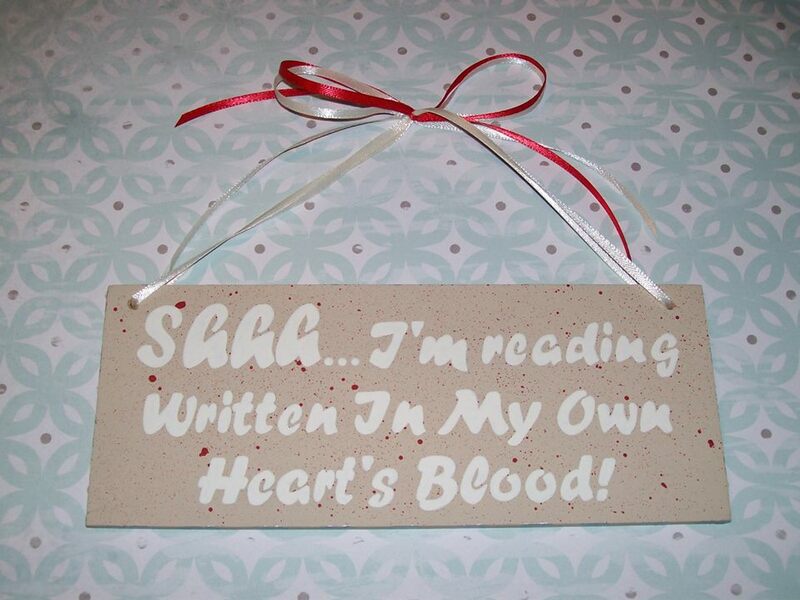 (1) “Shhh…i’m reading Writtin in My Own Heart’s Blood” hand painted sign from Natalie’s Bastelkiste. Giveaway begins now and will run thru September 27th, 2013. Giveaway is open internationally. Void where prohibited. Must be over 18 to enter. Great gathering of goodies! Can’t wait! Love, love, love the Outlander series!! Cannot wait for the new one!! If only it would come out in paperback right away! I CAN’T WAIT MOHB TO COME OUT!!! I love all things Outlander! Thank you for this opportunity! Thanks so much for such an awesome giveaway!!! I love that bracelet especially. What a fabulous contest! Thank you for the opportunity! I have read the Outlander Series from the first book in the 1990’s till now. However, I have never won anything relating to it, so this would be a treat! I think your Claire is perfect!!! And I hope that I will win!! Och, I canna wait for the premiere! These wonderful goodies would help bide the time, though! A “Claire=ebration” indeed! Umm…I’m in love with these things! What a lovely giveaway! I’d love to win. Oh, how exciting! I would LOVE to win!! What a great give away. Love it. ooh I want it all but mostly the cup and the bracelet!!! Great gifts! I’ll need a sign like the one for MOBY once it is out! This is an awesome giveaway! Thanks and God Bless! Great swag!!! I would love to win! Great giveaway!! Counting down for MOHB!! I’m so excited for the Outlander series and for MOHB! Great giveaway!! I have been reading this series since I was in highschool. That was oh so long ago!!! I can’t wait for the new series!!!! Outlander changed my life. I would love to win something. IS IT MARCH/APRIL YET?!?!? I am on the edge of my seat waiting…. That mug is really cute – great reminder for busy mornings! I would love to win this!!!!!!! This is a fun contest – count me in! I love them all. Select my name, please. 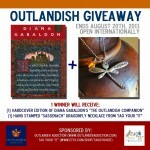 I love Outlander series and would love to win this. 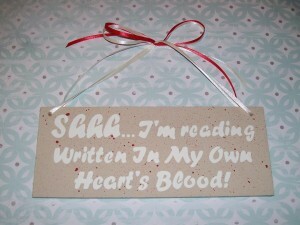 I have Written In My Own Heart’s Blood on preorder and can’t wait to get it!!!! 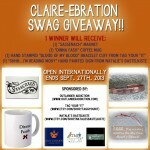 Bring on the Claire SWAG…! Oh, please, Oh, please, Oh, pleeease! I would definitely like to win! Super excited for things to come!! I would LOVE to have this gift pack! Can’t wait for March 2014 for the new book!! Great giveaway and so happy all of this is coming together! I so would like to win! Love this! What a great idea Thanks for such a great site! Can’t get enough of Outlander stuff! This is a fabulous giveaway!!! Thank you so much!!! These are awesome!!! I would love to win. Thanks so much for setting this up! What a great give-a-way…..fingers and toes crossed. What a great giveaway for a truly wonderful series!!! I’m loving all the Outlander excitement! Thanks for hosting this giveaway! I LOVE THESE BOOKS. DIANA HAS RUINED ME FROM, READING ANYBODY ELSE. Crossing my fingers and toes! OOH! How awesome! thanks for the giveaway! This is a great giveaway! I love how these books bring us all together! I might have to buy some of this stuff if I don’t win it though winning would be way more awesome! been reading the outlander series since they first came out. can’t wait for moby. What an awesome way to celebrate our Claire! I think Caitronia will be fantastic and the chemistry between her and Sam must be electric for Herself and Ron Moore to have chosen her! I would be sooooo happy to win these! Great giveaway. I love these items! Thanks for the chance to enter to win. Pick me pick me pick me! What a wonderful contest. Good luck to all Outlanders. 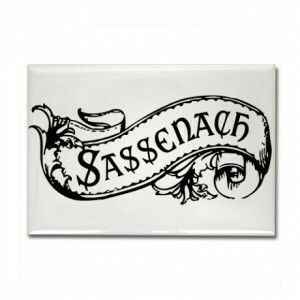 May the best Sassenach or Laddie win. Cannot wait for this series to begin! Or for MOBY. Swag would be nice. Thanks for the opportunity! I’m SO excited about Claire and everyone in the upcoming series, along with MOBY!!!!! I’m so excited that the greatest fictional historian book has SWAG! this is so cool! thanks for the chance!! I love all the prizes, especially the bracelet! Can’t wait!!! Thank you for this chance!! This is awesome! I can’t wait for the show. So excited for the show and this giveaway! All the items are great!!! I am so excited about the casting! I want to tell the world!!! So excited to see Outlander coming to STARZ and that the clan is gathering! Loving the casting choices so far. Some great items here to win. Thank you so much. Can’t wait for the show. Fingers crossed!! would love to win!! CAN NOT WAIT for the Starz show or the new book!!! Checking out your page for the first time! Would love to win, for that bracelet alone! I’m so relieved that they finally cast Claire, and so happy with their choice of actress. Awesome give-away!!! I think we are all celebrating the casting of Claire!!!! I will happily accept all Outlander swag, and am especially interested in the coffee mug. 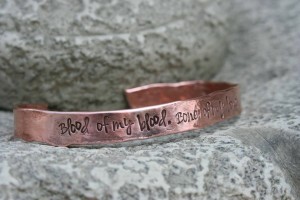 OH, and the bracelet. Hmm, all of it really. Thanks for your fun and informative posts. Love it! I happen to collect mugs and magnets… love the bracelet too. HAVE to figure out how to see this by next spring!!! This is lovely! hope I can win! I would love to win! Can’t wait for MOBY and Outlander on Starz. Got to have it! Thanks for the opportunity. I have been a fan since the early 1990’s when my hubby gifted me with Outlander. I have been a staunch fan since them, reading every book as it became available, thanks to Jett and his generosity in buying them for me. However, I will have to buy “Written In My Own Heart’s Blood” for myself, because My Jamie (Jett) has gone on to Heaven and left me behind. I would love to win any of these prizes, as they would remind me everyday of just how much I was loved while Jett was on this earth. Thanks for giving us this opportunity! So excited for the STARZ series and for MOBY to release!! This prize pack is amazing!! Thank you for the chance. Thanks for contest. Good luck everyone! Love all DG books! Can’t wait for the next! Also can’t wait for the TV show!!! I picked up Outlander in 1992 and I don’t think a year has passed that I haven’t been reading about Jamie and Claire! Thanks for chance to win some fantastic Outlander Swag! I love that Dinna Fash mug! Thank you for the chance to win! I am so excited! 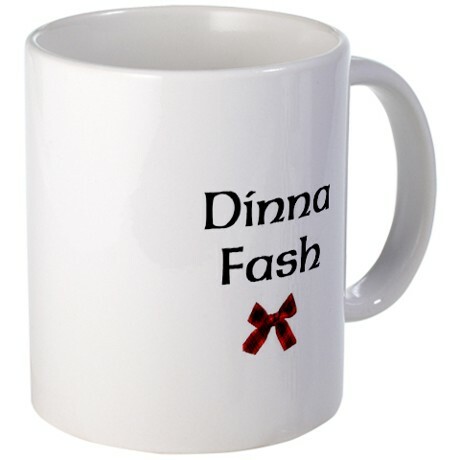 Love the mug, my granny from Blairgowrie used to say that to me. Greatest series ever. Herself is a literary genius. Thanks for the giveaway!! 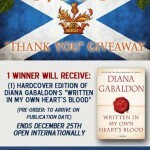 would love to win anything from Outlander Series!!! Sure hope I win! Have started re-reading the series to be ready for the next book. Looking forward to the show. I am amazed that, no matter what new book I read, new books never captivate me like the Outlander Series. 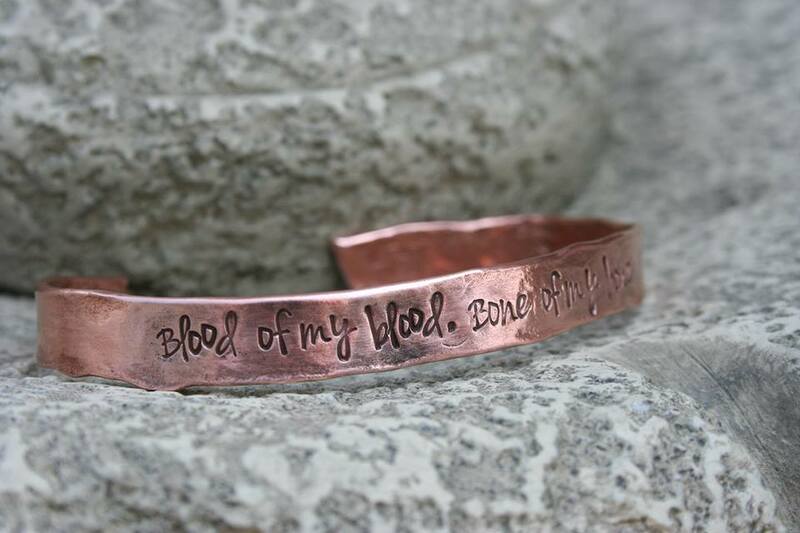 I’d love to have any of it, but especially the bracelet! So pretty! cool stuff . wishing for swag !